Carpenter Ants Northwest Termite & Pest Control uses various different methods to control and eliminate ants from in on or around a structure How ver our primary measures are using a liquid treatment of a colony eliminator that Elimates the ants at the source of were they are living weather they are in a wall, second story, in the soil away form the structure. 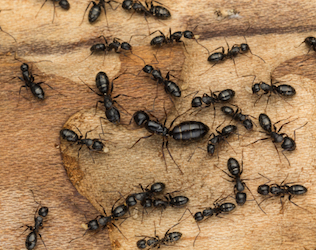 Some of these treatments take 7-21 days to take affect on ants sometimes it takes monthly service to get control of infestations at Northwest Termite & Pest Control we do our best to eliminate the problem pest as fast as possible. In many cases we are able to eliminate the problem pest immediately.